Our neighbour Mars once was covered by oceans and was much more similar to our Earth. But Mars lost most of its water and its early atmosphere 3 billion years ago. Now it has a very thin atmosphere (95% carbon dioxide) and surface temperatures between -143 °C (-225°F) and up to 35°C (95°F). Don't be fooled by the maximum temperature: during nights it'll always get very cold and the mean temperature on Mars is just -63 °C. Anyhow, the German Aerospace Centre (DLR) has discovered that lichens can survive on Mars by simulating the temperature, pressure, radiation intensity and mineral composition of Mars. So, the current conditions allow life on Mars, at least for microorganisms. The Sun constantly emits charged particles in all directions; we are talking about 4 - 6 billion tonnes every hour. This solar wind can hit any particles of an atmosphere (e.g. of Earth or Mars) at any time and due to the high velocity of these particles (between 400 and 750 km/s) this can strip away the gas in the atmosphere of planets. The difference between Mars and Earth is that Earth has a strong magnetic field that extends far into space. This magnetic field deflects most of the particles of the solar wind (which are mainly protons and electrons), thereby protecting our atmosphere. The source of our strong magnetic field is the motion of molten iron alloys in the outer core of our planet; the principle is similar to that of a dynamo. 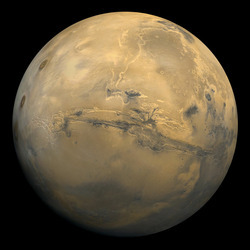 Now, Mars is much smaller than Earth - it has just 11% of Earth's mass - and therefore has cooled down much more quickly. At a certain point in Mars' history the iron in its core solidified and there was no more molten iron that could sustain the magnetic field. After the collapse of its magnetic field, the particles of the solar wind could collide with Mars' upper atmosphere, giving the atmospheric particles enough kinetic energy to escape from the planet. That's a pity. If Mars had been a bit more massive than it actually is, the red planet could have preserved its atmosphere and its water... and who knows what this planet would look like today? Maybe like this?